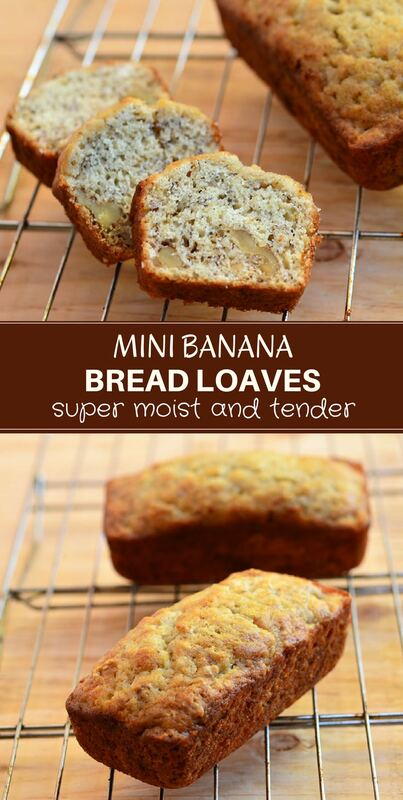 Mini Banana Bread Loaves are the perfect way to use up ripe bananas! 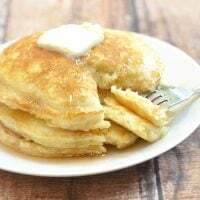 With super moist, tender crumb generously studded with crunchy walnuts and loaded with banana flavor; they’re fabulous for breakfast or midday snack. And they make great gifts, too! One of my simple pleasures in life is enjoying a muffin or a slice of quick bread loaf with a piping hot cup of Mexican hot chocolate in the morning. Seriously, what better way to start the day than a homemade baked treat paired with a sinfully rich chocolate drink? I have an assortment of fruited bread loaves on regular rotation for my morning ritual, but this banana bread is what I make more frequently. 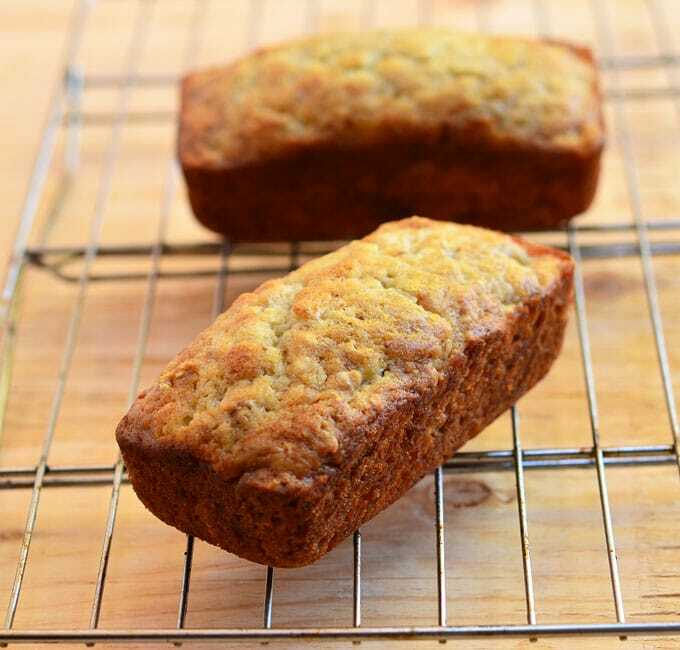 I always seem to buy more bananas than we could possibly consume at home and this quick bread loaf is an excellent use for very ripe ones that might have otherwise gone to waste. Mini banana bread loaves are fabulous for breakfast or anytime pick-me-up snack. Super moist and tender with loads of crunchy walnuts and banana flavor, they’re sure to be a hit at potlucks or parties. The recipe makes four mini loaves which are the just the right size for gift-giving. Wrap individual bread in cellophane, tie a fancy ribbon or tag, and presto! A homemade care package everyone will appreciate. 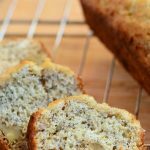 Can you Make Banana Bread with Fresh Bananas? 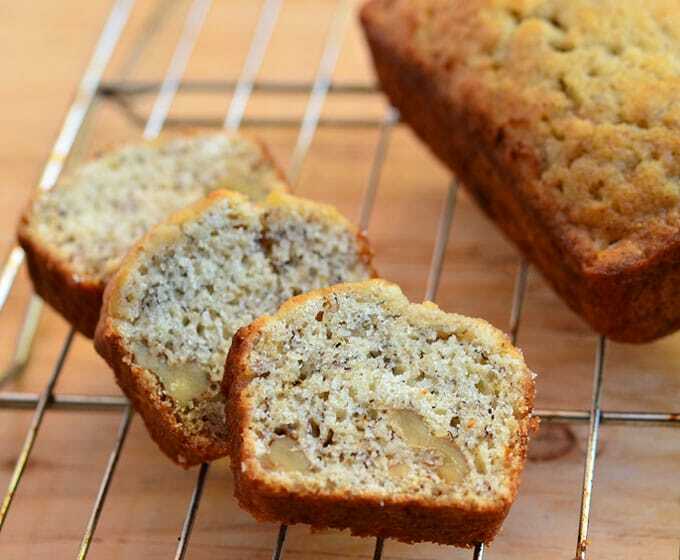 For a more intense flavor, use very ripe bananas. They’re easier to mash and imparts a sweeter taste. Choose bananas that have completely yellow skin with brown speckling throughout. 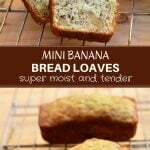 How Long Do You Cook Mini Loaves of Banana Bread? Banana bread loaf in a regular-sized 9 x 5 pan will take about 50 minutes to 1 hour at 350 F to bake. Since we are baking these in mini loaf pans (5.73 x 3 inches), we reduce baking time to 30 to 35 minutes. 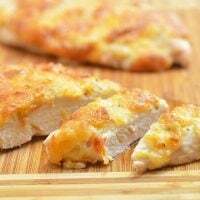 As ovens work differently, the best indicator of doneness is inserting a toothpick in the center. If it comes out clean, the bread is ready. 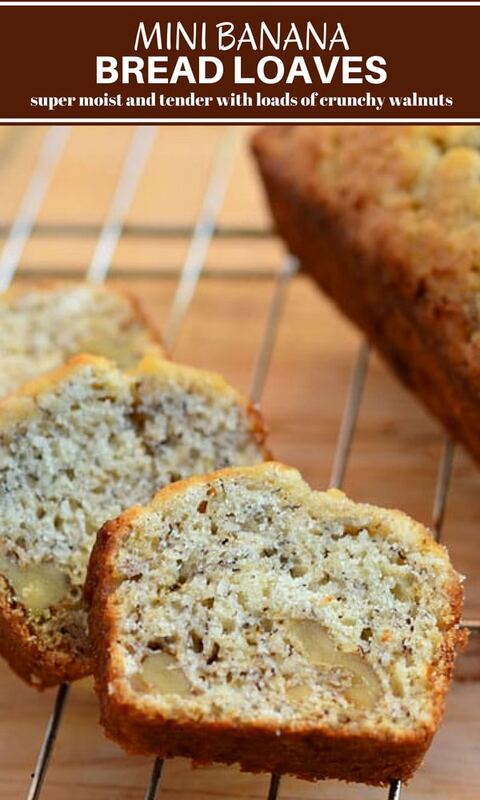 Mini Banana Bread Loaves are the perfect way to use up ripe bananas! 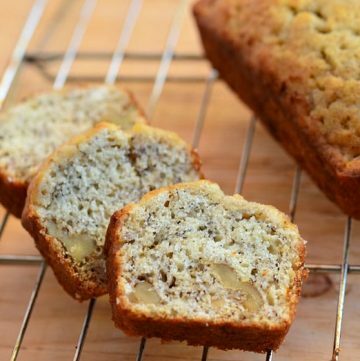 With super moist, tender crumb generously studded with crunchy walnuts and loaded with banana flavor, they're fabulous for breakfast or midday snack. And they make great gifts, too! Prepare loaf pans by greasing bottoms ONLY. In a large bowl, combine sugar and butter. 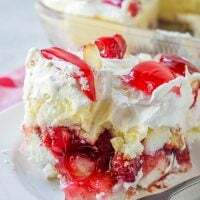 Using a mixer, beat until creamy. Add eggs, bananas, buttermilk and vanilla extract. Beat on medium speed until blended and smooth. Add flour, baking soda, salt, and nuts. Stir just until moistened. Divide batter into prepared loaf pans. Bake in a 350 F oven for about 30 to 35 minutes or until top is golden and a toothpick inserted in the middle comes out clean. Remove from oven and allow to cool for about 3 to 5 minutes. 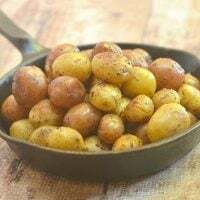 Remove from pan and transfer to a wire rack. Completely cool before slicing. Nutritional information calculated at 4 servings per mini loaf.